Land Rover and Range Rover luxury SUVs are a sure way to get noticed on the roads of Staten Island, East Brunswick, and Somerset. You can drive in supreme comfort surrounded by the latest in technology and upscale features. 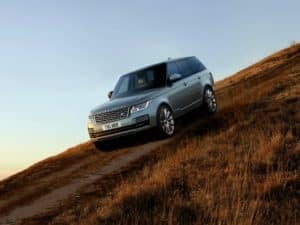 At this point, you’re probably wondering, “Where can I find a Land Rover dealer near me?” Just down the road at Land Rover Edison, we’re here to match you with the luxury vehicles of your dreams! When you’re shopping for Land Rover SUVs, our showroom is the place to go. From vehicles like the Range Rover Velar and Range Rover Evoque to the Land Rover Discovery Sport, we have all the latest luxury SUVs waiting for you. Our team of vehicle experts is excited to help you learn all about them! Land Rover vehicles come equipped with highly modern technology, like InControl® infotainment. There’s also off-roading technology, like the Terrain Response® traction system, which uses different drive modes to make your trek over different types of terrain much easier. Once you’ve found the perfect vehicle, the folks at our finance center can help you create a payment plan. Whether you need an auto loan or Land Rover lease, they’ll leave no stone unturned as they explore your most promising options. To get started, just apply for financing online. Long after you’ve driven off our lot, you’ll need service to keep your ride running at its best. Here at our on-site service center, our fully certified technicians can help you with all your maintenance needs. From oil changes to brake inspections to battery tests, our Land Rover dealership can handle it all! Where Can I Find a Land Rover Dealer near Me? The team at Land Rover Edison invites you to stop by our showroom or visit our finance, service, or parts centers. We’re happy to help shoppers across Staten Island, East Brunswick, and Somerset with all their automotive needs. When you’re ready to get started, just reach out to the team at our Land Rover dealer. We look forward to working with you!